We have said it before and shall say it again: the Berkshire Brewing Company is an outstanding little brewery offering an impressive range of outstanding brews. I am typically skeptical of bottled “black & tans” and, as a general rule, prefer to have mine mixed… table side… a private Russian nurse named Tiffany. 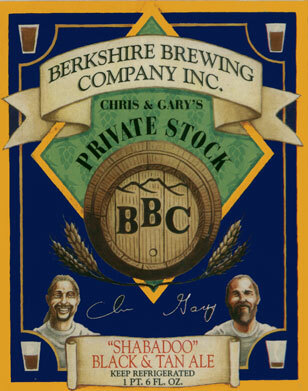 To honor the changing seasons, however, I tucked into a bomber of BBC’s Private Stock Shabadoo Black & Tan. I wasn’t disappointed. Notes: Bomber at Castle von Brue. Appearance: Gorgeous rusty, leathery chestnut. Perfect cascade. Head: Nice, creamy milk chocolate head with immediate lacing as the bubbles subsided. Nose: Sweet romas of roast, carmel, and coffee. Not too complex, but imminently familiar. Taste: Again, sweet without being cloying… familiar without feeling claustrophobic. Roasty, milky goodness with a subtle, bitter back. A liquid hug. Drinkability: Limitless. A silky smooth, amazingly comfortable libation that drinks like a lighter brew than it is. BBC also donates 10% of gross sales of this beer to the Food Bank of Western Massachusetts, so your consumption helps a good cause. Rating: 3 hops and more than a modicum of amazement that a bottled black & tan could taste so solid. Posted in Tasting Notes.Tagged BBC, Berkshire, Black & Tan, Shabadoo. I love this beer and truly believe it’s the only good example of a “Pre-mixed” black and tan on the market. Tasty little beverage.